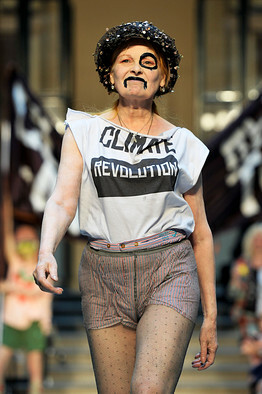 "The 71-year-old combined the shortest of shorts with clumpy platforms, chunky socks, a sequinned hat and a ragged T-shirt proclaiming “climate revolution”. If that wasn’t bizarre enough, she topped it all off by drawing a crude moustache and monacle on her face with black marker pen – and at one point had what appeared to be a leather whip in her mouth. Supermandia and the most supersilly Climategate rebuttal ever | Watts Up With That?